Ordering a Pet Portrait is quite easy. 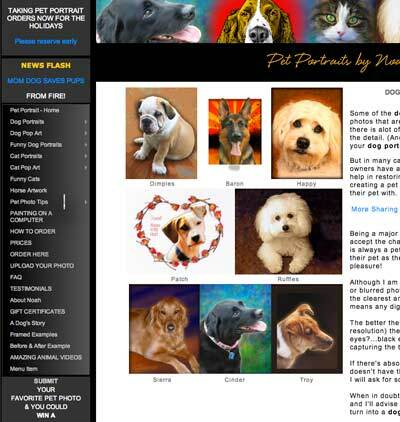 First you should select a style that you would like to have your Pet Portrait done in. You can choose from Traditional, Pop Art or Comic. Or you can even order your own concept by writing me and I'll create it for you! Once you've decided on the style of painting you would like, pick an image on my site that appeals most to you and mention it when you complete my request form for a pet portrait. This gives me a general indication of what you are looking for. 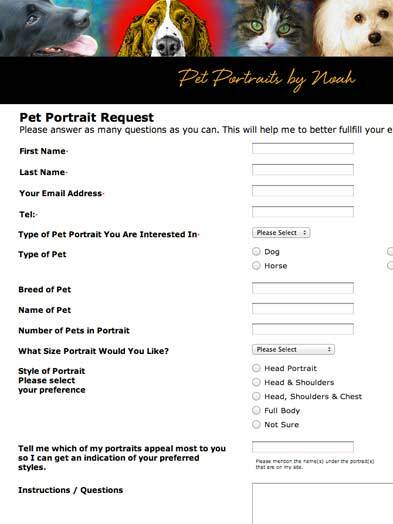 The next thing to do, is to upload a digital photo of your pet using my REQUEST FORM. The request form is located on each page in the green navigation bar at the left of the page and is listed as "ORDER" or "UPLOAD YOUR PHOTO'. Here is where you also give me any particular instructions, and select which style (traditional, pop art, comic) you're choosing from the drop-down menu. The request form will ask for information that must be completed in order for me to give you a final costing of the pet portrait that I will create for you. All the choices will be explained on the form as you fill it out. 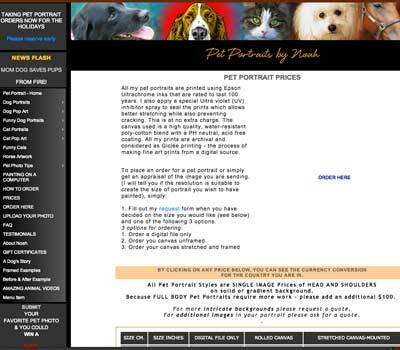 Once I receive your information and the image(s) of your pet, I will send you a final price. There is NO OBLIGATION. In fact this is a perfect opportunity to have you photo(s) professionally appraised at no charge. I will tell you if they are good or sharp enough for me to create a pet portrait from. If you agree with the final cost, I will then invoice you 50% as a deposit via PAYPAL. PAYPAL accepts all credit cards and is the most trusted way to purchase online. To see prices, please visit my price list page. There is an international currency converter that will give you the current price in any currency. Simply click on any price to activate the converter. As I progress through the painting of your pet, I will post PROOFS for you to look at on my site. you can then tell me what changes (if any) you wish to make. Once the portrait is completed, I will invoice you for the balance of the portrait before I ship it to you. They are a global leader in online payment solutions with 100 million account members worldwide.